Hurricane Irene was a large and powerful Atlantic hurricane that left extensive flood and wind damage along its path through the Caribbean, the United States East Coast and as far north as Canada (Figure 1). 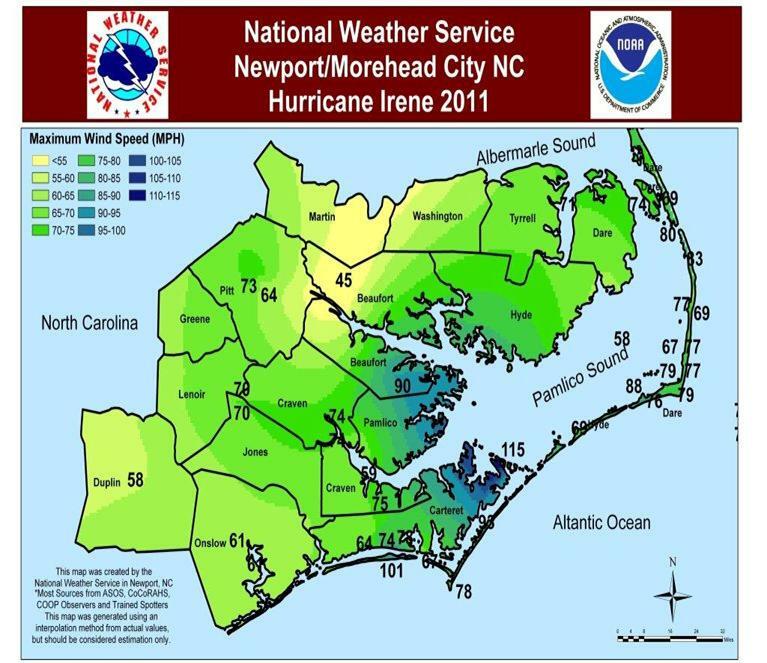 Irene made landfall near Cape Lookout, North Carolina at around 7:30 AM EDT on August 27, 2011 as a strong category 1 storm (Figure 2). Irene caused 5 deaths in North Carolina. On the evening of August 26, well ahead of landfall, Hurricane Irene also spawned several tornadoes. One EF-2 tornado near Columbia in Tyrrell County demolished at least 4 homes and overturned cars. Precipitation totals associated with Irene were particularly high (Figure 3) with totals ranging from around 5 inches over the Northern Outer Banks, to around 15 inches in Beaufort County. Bunyan in Beaufort County reported 15.66 inches. Doppler Radar estimated totals of over 17 inches in portions of Beaufort, Craven and Pamlico Counties (Figure 4). Extensive storm surge and wind damage also occurred with Irene. The peak wind gust recorded was 115 mph at the Cedar Island Ferry Terminal in Carteret County as the eye was moving ashore (Figure 5). Trees were down throughout eastern North Carolina and thousands were left without electricity. Ocean and Sound overwash created numerous breaches of Highway 12 along the Outer Banks. Figure 4. 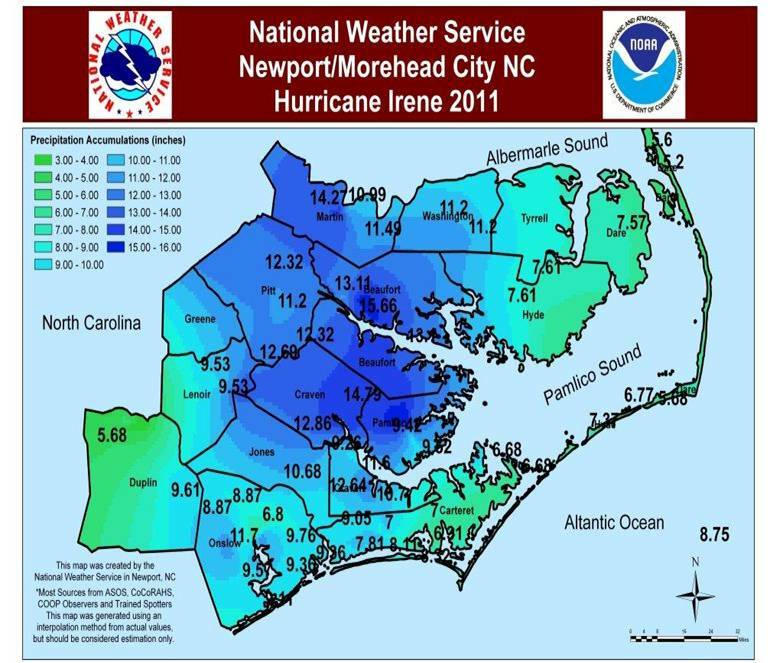 Newport/Morehead City Doppler Radar Estimated Rainfall for Hurricane Irene. Note the large white area of over 17 inches over Beaufort, Craven and Pamlico Counties. Figure 5. Peak Wind Gusts from Hurricane Irene, August 27, 2011.The peak wind gust recorded was 115 mph at the Cedar Island Ferry Terminal in Carteret County. Hurricane Irene evolved from a tropical wave that exited the African coast on August 15, 2011. With a favorable environment ahead of the wave, a Tropical Depression formed on August 20 as the wave approached the Lesser Antilles. By 23Z on August 20, the depression was upgraded to Tropical Storm Irene. On August 21, the surface center reformed closer to the deepest convection, as an anticyclone aloft provided supportive outflow over the cyclone. With the improved structure, as well as light wind shear and high sea surface temperatures, Irene was forecast to strengthen to near hurricane force prior to landfall in Hispaniola. Over the subsequent day (August 22), while passing near the island of Saint Croix in the U.S. Virgin Islands, Irene moved toward Puerto Rico, more northward than initially expected, where it underwent a considerable increase in strength and organization. Hours later, Irene moved ashore, approaching from the southeast at landfall near Punta Santiago, Puerto Rico, with estimated sustained winds of 70 mph. 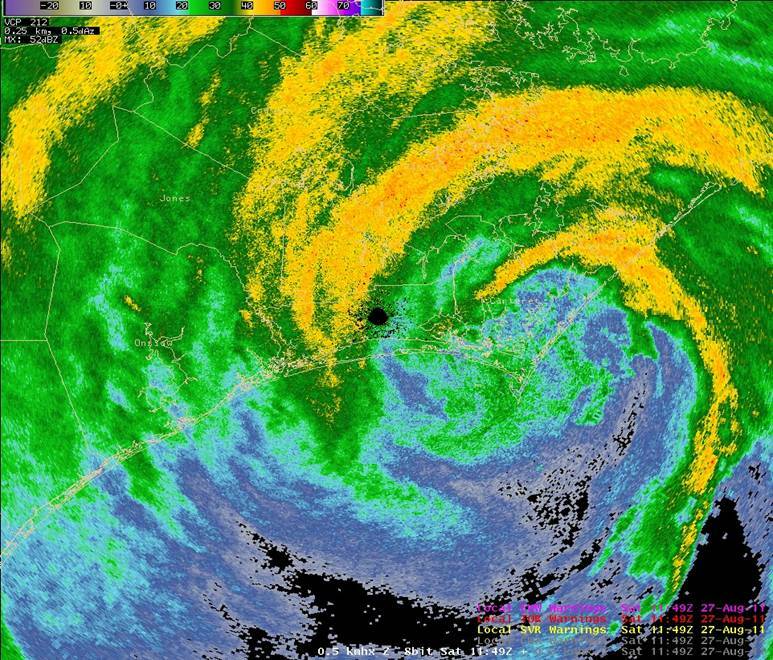 Despite the storm's interaction with land, radar imagery showed a ragged eye-like feature, and Doppler radar data indicated wind speeds in excess of hurricane force. Just after its initial landfall, Irene was accordingly upgraded to a Category 1 hurricane, the first of the 2011 Atlantic hurricane season. After briefly weakening on August 23, Irene began to develop a distinct eye encircled by an area of deepening convection the next morning. Moving erratically through the southeast Bahamas over very warm waters, Irene quickly expanded as its outflow aloft became very well established. The hurricane intensified into a Category 3 major hurricane as it recurved toward the northwest along a weakness in the subtropical ridge. Irene would gradually weaken to a strong Category 1 storm as it approached the North Carolina coast as dry air wrapped into the hurricane. Tropical-storm force winds began to affect the Outer Banks and Crystal Coast during the early evening hours of August 26. Additionally, Irene spawned several tornadoes during the late evening hours of August 26, producing significant damage in Tyrrell, Washington and Beaufort Counties. Figure 6 shows the strong rotational couplet associated with an EF-1 tornado near Creswell, North Carolina around 1055 pm August 26. Figure 6. 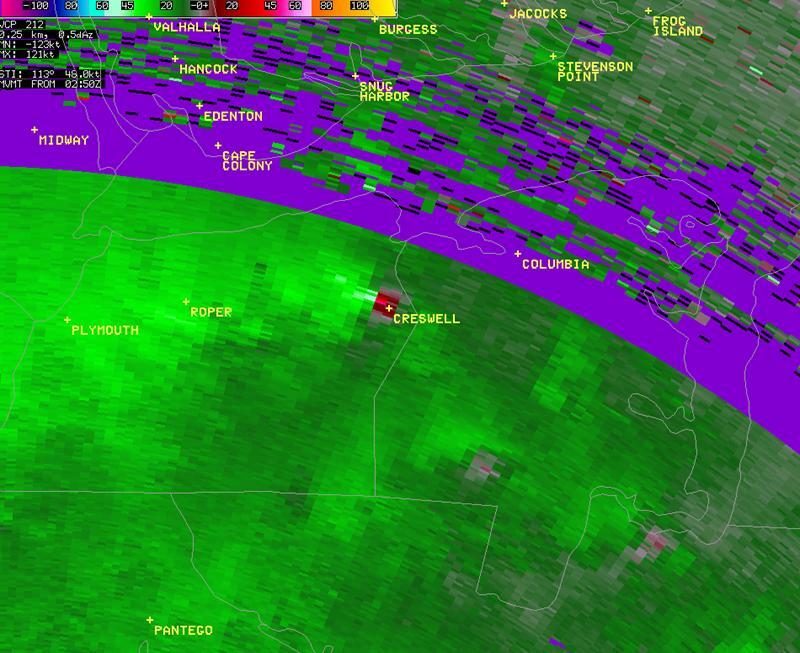 Strong Rotational Couplet in the Doppler velocities from Creswell, NC around 1055 pm August 26. This couplet produced an EF-1 tornado. Irene made landfall between 7:30 and 8 AM EDT Saturday August 27 near Cape Lookout, North Carolina. As the eye wall moved ashore, wind gusts to 115 mph were observed at the Cedar Island Ferry Terminal. The lowest pressure observed with the landfall of Irene was at Beaufort (Figure 7) with 28.11 inches of mercury or around 951 millibars at 8:56 AM. Strong winds and driving rains pounded most of Eastern North Carolina into the mid-afternoon hours on Saturday. As the eye moved inland, strong westerly winds on the backside of the storm gusted to near 100 mph at Atlantic Beach around 10:30 AM. Torrential rainfall amounts in excess of 10 inches were widespread. Storm surge levels of over 10 feet were observed at Ocracoke and several breaches of Highway 12 were noted all along the Outer Banks. A total of 5 people were killed in North Carolina as the result of Irene. THE FOLLOWING ARE UNOFFICIAL OBSERVATIONS TAKEN DURING HURRICANE IRENE.